The Ford F-150 series has been around for decades, with the first units dating back to the late 1940s, and loved for its rugged looks and performance. And its introduction in the market created a new market and a loyal set of buyers and enthusiasts looking for a different breed of vehicles on and off the road- one that’s tough, dependable and ready for work. As one of the oldest nameplates around, one would think that its manufacturer is ready to retire the F-150 name, and call it a day. 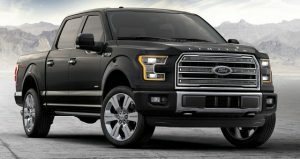 But Ford has other plans, and this 2017, the company has unveiled its 2017 Ford F-150 that was designed with more durability, capability and power in mind. And for the 2017 version of the vehicle, Ford enthusiasts and buyers can count on a ‘smarter and safer’ F-150 to come out of Ford’s production line. The Ford F-150 has been known for its rugged construction and dependable services, and these are the reasons why the F-150 has been the choice pick-up truck in the United States, and many parts of the world. But this year, Ford pushes the envelope once more by building stronger Ford F-150, thanks to the use of exclusive, military-grade and high-strength materials, often used in commercial transportation and aerospace industry. The main objective of the company is to make vehicles lighter, without compromising quality and durability. And this is exactly what one can expect from the leaner Ford F-150 for 2017. Thanks to the use of these materials and technology, the frame of the new truck is 60 lbs lighter, but still retaining its dent-resistant qualities. Safety-wise, the 2017 Ford F-150 is also an established player, thanks to new innovations and technologies incorporated in the vehicle. The SuperCrew and SuperCab variants are the only pick-ups with Forward-Collision Warning capabilities that have been certified with a 5-star rating by the NHTSA, and a top safety pick as well by the IIHS. On top of these certifications, the F-150 is also loaded with more than 30 safety options that can make every vehicle safer bet on and off the road. And the safety is not just found on the advanced safety options that can cost you a few thousands of dollars; the safety starts in every basic trim, thanks to the use of high-strength stainless steel for the cross-members. With a powerful selection of engines, from the 2.7-liter Eco Boost V6 engine to the high-output rating DOHC 24-valve 3.5-liter Eco Boost engine, enthusiasts and drivers can count on a pick-up that can do wonders for different jobs, in various road conditions. For the driver looking for more power, the engine used for the Raptor is the obvious choice. Exclusive on the Raptor is the twin-turbo DOHC 24-valve 3.5-liter high output Eco Boost engine, that comes with direct fuel injection and port fuel injection. This is expected to offer more power than its predecessor, the 6.2-liter V8 engine that produces 450 horsepower. Thanks to a wide selection of engines for different trims, enthusiasts and busy business owners can count on a powerful and capable pick-up truck. Its capability can be tested in terms of its towing power and payload. All variants of the F-150 feature the Pro Trailer Backup Assist and other smart towing technologies like trailer brake controller and Smart Trailer Tow Connector. All these smart features allow for the synchronization of trailer and truck brakes. And in terms of payload, the new generation of pick-ups available in the market beat out the competitors, thanks to more than 3,000-lbs in payload. 2017 F-150 XL. Starting at $26,730, this is the ‘cheapest’ trim in the lot, but comes with the standard powerful engine and features that help make the F-150 a reliable pick-up in the market. Some of the standard features of the XL are he 3.5-liter Ti0VCT V6 engine, a 23-gallon fuel tank, Trailer Sway Control and 17-inch silver steer wheels. Based on tests, the XL submits 18 miles per gallon for city driving, and 24 miles per gallon for highway driving, based on tests and EPA estimates. 2017 F-150 XLT. Starting at $32,100, the XLT offers a premium suite of features that include BoxLink, fog lamps to improve visibility, SYNC for information and entertainment (also standard on the XL), Electronic 6-Speed Transmission with Tow/Haul Mode and Sport Mode and with 4 engines to choose from, including 5.0L V8 FFV engine. 2017 F-150 Lariat. Starting at $40,460, this trim can be powered by the 2.7-liter Eco Boost V6 engine with a maximum payload of 2,210 lbs. Other standards that can be expected from this trim are LED box lighting, window – rear – power sliding glass with privacy tint and the 8” productivity screen. Based on road estimates, the Lariat has 19 miles per gallon for city driving and 26 miles per gallon for highway driving. 2017 F-150 Raptor. Starting at $48,860, the Raptor is one of the most awaited variants under the F-150 line-up for the right reasons. While it ‘scores low’ on fuel efficiency, with 15 miles per gallon for city driving and 18 miles per gallon for highway, the Ford F-150 Raptor is a certified performer, at least in terms of power and capability. For starters, the Raptor is equipped with a high-output engine, the 3.5-liter V6 Eco Boost engine that comes with an auto start and stop. The Raptor also becomes a capable partner off the road, thanks to the FOX Racing Shox. And no matter what terrain you are in, the Ford F-150 Raptor is clearly on the task, thanks to its Terrain Management System, giving drivers up to 6 drive modes to choose from. 2017 F-150 King Ranch. Starting at $50,675, the King Ranch offers a touch of luxury, on top of the usual raw power one can expect from the Ford F-150. A registered trademark, King Ranch features King Ranch leather trim for the front and bucket seats. These are also heated and cooled that can help provide luxurious comfort to the drivers and passengers, even when faced with rough road conditions. There’s also the 110-volt/400-watt Ac plug outlet that can let you do the work or get entertained even if you are on the go. 2017 F-150 Platinum. There’s a reason why this trim is called Platinum, and it starts with the price of $53,230. Some of the premium standards that can be expected on the Platinum are Class IV Trailer Hitch and the Equipment Group 700A that includes power deployable running boards, Blind Spot Information System and the Reverse Sensing System to name a few. 2017 F-150 Limited. With a price tag of nearly $60,000, some buyers and reviewers as asking if the price is right for this model. The Limited trim has all the trimmings that make the 2017 Ford F-150 both powerful, luxurious and capable on and off the road. There’s only one engine available- the high output 3.5L V6 EcoBoost® Engine. All the premium features are here including 360-Degree camera with split-view display, remote tailgate release, twin panel moon roof and LED tail lamps. While the manufacturer badges this as their limited version of the F-150, many in the automotive industry calls this pick-up the ultimate ‘pick-up’, successfully capable and powerful, in the most luxurious fashion possible. The specs, new technologies and trims available help solidify the standing of Ford F-150 as the best-selling pick-up not just in the US, but also in different parts of the world. The Ford pick-up is a capable worker, designed for the discerning driver who demands the best performance on and off the road, regardless of road conditions. And with some luxurious trimmings on some trim levels, including the King Ranch, Platinum and Limited, enjoying raw power on and off the road can become comfortable and luxurious, too. The New 2017 Ford F-150 has come a long way.